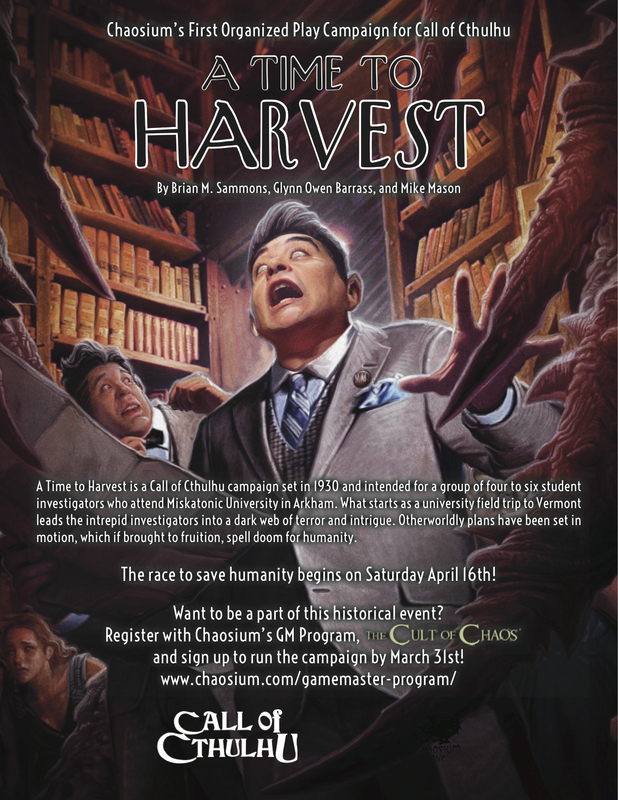 A Time to Harvest is a campaign unfolding over six months, which will be offered free to all members of The Cult of Chaos, Chaosium's Game Master and Organized Play Program. “It’s a tightly focused campaign, set in Lovecraft Country, which is inspired by and builds on H. P. Lovecraft's tales", said Mike Mason, line editor for Call of Cthulhu. Written by established Call of Cthulhu authors Brian Sammons, Charles P Zaglanis, Glynn Owen Barrass and Mike Mason, A Time to Harvest is an an ideal campaign for novice Keepers and players alike, with plenty of advice throughout, but veteran players will also find it engaging and fun too. "Things are not always what they seem and the players will have to navigate the various twists and turns. It’s also pretty fast paced, with plenty of action putting the investigators into dangerous situations. Whether around the learned halls of Miskatonic University, the streets of Arkham, or the wilds of Vermont, the players will have plenty of opportunities to explore, investigate, and face threats not of this world!”, said Mason. Todd Gardiner, Chaosium's Director of Organized Play said, "We are so excited to provide this opportunity for Keepers to bring play to gaming groups, stores and homes where they live. As we ramp up to the release of the seventh edition of Call of Cthulhu, bursting out on the scene with a new gaming initiative shows out commitment to reaching new players. Do you and your allies have the mettle to face off against new horrors, about to be unleashed?" Want to run A Time to Harvest but don't have time to create characters? Try one of the pre-generated student characters we have available thanks to Ben Wilson. Q: What is the "A Time to Harvest" Organized Play Campaign? A: A Time to Harvest is a Call of Cthulhu campaign unfolding over six episodes, with each episode released on a monthly basis. The campaign is set in 1930, with the players taking on the roles of students from Miskatonic University in Arkham who are drawn into a dark web of intrigue. Each episode follows on directly, building the story and taking the students to a variety of locations in Lovecraft Country and beyond. Q: What edition of Call of Cthulhu is the campaign written for? A: Call of Cthulhu 7th edition. Q: What if I don't have 7th edition yet and still want to play? A: The full Call of Cthulhu 7th edition rules are available in PDF, epub, and mobi formats from www.chaosium.com now. The hard copy rule books will available from mid-April 2016. Q: What is the launch date? A: The campaign officially kicks off on Saturday April 16th, 2016, to coincide with the release of the physical copies of Call of Cthulhu 7th Edition. We don't expect Keepers to begin running the campaign until sometime in May (when they have read it through and have the new rulebook in their hands), although of course, you can start as soon as you wish. We'll be sending out episode 2 in mid May. Q: If I want to take part, what do I need to do before then? A: Anyone who wishes to be a Keeper (Game Master) in the campaign needs to join the Cult of Chaos, Chaosium’s Organized Play and Game Master program. Joining up is simple and free, just go here. Q: If I’m already member of the Cult of Chaos, do I need to do anything to register? A: If you're in the Cult already, you don't need to do anything further at this stage. All registered members of the Cult of Chaos will be invited to sign up to run the OP Campaign and receive the first installment by the end of March. Q: If I’m going to be a Keeper, how will I receive updates and instructions? Q: How does the Campaign unfold? A: Each episode follows on sequentially towards the OP campaign's climax. It is a linear progression, although within each episode, the investigators usually have a range of things/routes to take - some episodes being more sandbox than others in this fashion. As to frequency of play, that's up to you as the Keeper. Ideally, you will run one episode per month (either weekly, fortnightly, or monthly), but obviously some groups may take longer or shorter. Each episode contains what's needed for that month - preparing an episode is basically down to how long it takes you to read it through and make whatever notes you require. Month One provides episode one but also general campaign information of use throughout the campaign, thus you’ll have a lot of key info upfront. Q: What is the minimum age for participants? A: Keepers/GMs in the Cult of Chaos must be eighteen years and over. For players, A Time to Harvest should be fine for most teenagers - if necessary, the Keeper can of course tone things down according to their play group (equally, ramp things up for older and "hardened" gamers). Q: Where can I play this? Is playing at home acceptable, or does it have to be in a game store or at a convention? A: Playing at home is perfectly acceptable! Your friendly local game store is an ideal place to help spread Call of Cthulhu to new players, so also highly recommended! We will even be providing sign-up flyers to help you recruit players. A convention may not be ideal, since the campaign is being sent out in monthly installments and the story is meant to build on what happened in previous sessions. Q: Can I play in the campaign online? A: Absolutely! We've heard of people planning to play through Roll20, for instance. Some groups may even stream their play through TwitchTV. Q: How many people does the campaign accommodate? A: The campaign will work best for groups of 4 to 6 players, plus a Keeper. Q: What does it cost to participate? A: Participation is completely free, for both Keepers and players. Q: Who has written the campaign? A: The authors of A Time to Harvest are Brian M. Sammons, Charles P. Zaglanis, Glynn Owen Barrass, and Mike Mason (mike@chaosium.com), all well-established Call of Cthulhu writers whose other works you might be familiar with. Mike is Chaosium’s Call of Cthulhu line editor. Other people directly involved in the OP program at Chaosium are Todd Gardiner (todd@chaosium.com), Dustin Wright (dustin@chaosium.com) and Michael ‘MOB’ O’Brien (mob@chaosium.com). Q: Will there be a book release of A Time to Harvest at some stage? A: Yes, Chaosium will publish the whole campaign as a full color supplement down the line, after the OP campaign has concluded. We’d love to incorporate feedback from the Organised Play run in the book version. Q: Err… is organized play possible for a game where characters can easily die or go insane? A: Fortunately the player characters are Miskatonic U grad students... an infinitely renewable resource!